Left your t-shirt in my room, still smells of you And the picture you hung on the door lay smashed, picture perfect. Explains now, clearly nothing left but a memory We only made out you never kissed me that's how I learned to hold back all feeling Pre Chorus: Wait, please don't go, I won't stay. All these words on replay. I'm ok, Its alright, good to know that your fine. Chorus: Pretending everything is right, to make it better. 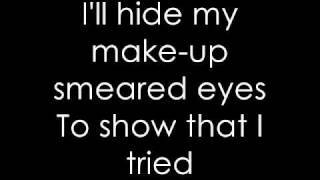 I'll hide my make up smeared eyes, to show that I'm fine. Verse 2: Some how you have managed to get under my skin, more than anyone ever did. And if every whole makes a scar and every scar marks its place then I will never live freely without your trace. And it'll never be fair, I wrote my songs for you and you never even cared. So Ill forget you, Illwashyour t-shirt, kill the pillow and cut you out of pictures Pre Chorus: Wait, please don't go, I won't stay. All these words on replay. I'm ok, Its alright, good to know that your fine. Bridge: And this drama filled fest all my fault I guess. But you told me pr?t endings for the best. And I held out as far as I could go. Do you miss me Id really like to know, that youre left with a feeling I let go.